One of the easier plants in the aquarium hobby to care for, Anacharis, an originally South American plant is also known as the large-flowered waterweed. It’s certainly among the prettier underwater plants out there, with its long, green strands of leaves. It’s a particularly popular plant among beginners, especially since it’s adaptable to a wide range of water conditions, although warmer climates—over 50 degrees Fahrenheit—are preferable. Aside from the visual purpose it serves, it can also be a food source for goldfish and apple snails in your aquarium. Additionally, this serves the purpose of ongoing pruning, which helps to keep its appearance lush and visually appealing. Characterized by a prolific growth rate, Anacharis is among the plants that can really take over an area and can be difficult to eliminate. And large amounts of vegetation can lead to overpopulation and stunted fish. Not so much an issue in an aquarium where you can easily prune and remove it but can be an issue in ponds and lakes. A great option for increased oxygenation in a tank, and a plant that functions optimally in high light, it isn’t difficult to care for as long as some basic care requirements are met. In this article, we take a detailed look at Anacharis plant care, from substrate requirements to ideal water paramaters, lighting needs to fertilization, and how to propagate and grow your own at home. As always, there’s a lot to learn. But no need to worry, maintenance of this fast-growing beginner plant is pretty straightforward. Origin: South and North America. Best grown in slow-moving water. Will root itself in gravel with ease, but can also be a great floating plant. Maximum Size: 23.5 inches in length and 1–3 inches in width per stem. Tank mates / Compatibility: In vegetation with goldfish and apple snails, and in small tanks. Originally from warmer climates in South America, it is a perennial plant that was introduced to North America by the aquarium trade. This submerged, freshwater herb is relatively widespread regionally and can be found in both still and flowing waters. It can also form dense surface mats that restrict water flow. Staminate flowers often grow on their leaves in North America. It’s quite popular as an aquarium plant. It’s coloring gives aquariums a lush appearance given its dark green hues. The green pigmentation differs from individual to individual, and can sometimes also alter based on the water conditions where it is placed. Each plant is a long, green stem with small leaves covering its length. In the wild, each stem can grow up to three feet in length and three inches in width. In the store, they are usually at around six to eight inches in length. Sometimes it produces a pale white flower that floats or rises above the water level. The roots can develop anywhere on the stem, sometimes growing to the substrate while at other times simply dangling in the water tank. Some mistake it for Canadian waterweed, which has shorter and less numerous leaves per whorl. It is pretty fast-growing and can double in size in as little as a month! Anacharis is mostly a floating plant and does not need to be planted in the gravel or substrate. It grows much faster when free-floating. On warm, sunny days, it will rise to the surface to take in sunlight, while on cooler or cloudier days, it may fall to the bottom of the water. Given the fast pace of its growth, it’s best to provide a large enough aquarium that will not be compromised as it grows. As a popular free-floating plant, it offers shelter and a hiding place for baby fry fish, juveniles, and some small adults. Additionally, it allows fish a place to deposit their eggs when they are breeding. It is a food source for herbivorous species such as the black swan, Cygnus melancoryphus, Fulica armillata, some snail species, and others. It is a great oxygen source as well. Another benefit it brings is consuming fish waste, phosphates, and ammonia. This is to the benefit of all living creatures in the aquarium, especially in terms of it preventing algae growth. Usually thriving in tropical environments, for your Anacharis to grow healthily you’ll need to recreate a habitat close to that. Fortunately, it can work well in both cold water and tropical water tanks. Although, nailing the right tank conditions to ensure good health might take some attention to detail, but once you’ve done your research, it should be fairly simple to maintain. Let’s take a look at what optimal conditions entail. It’s recommended to provide at least a 20-gallon tank. for growth and a stable environemtn in which to grow, while not taking up too much aquarium space for any fish. Anacharis plants are best in hard water with a KH of 3 to 8 and a pH in the 6.5-7.5 range. Temperatures should ideally be between 59 and 82 degrees Fahrenheit. They don’t do well in low light, which can lead them to die, so moderate to high light is preferable. Preferably full spectrum 5000 to 7000 bulbs, be it LED bulbs or fluorescent bulbs, are recommended for proper Anacharis care. However, overly intense aquarium lighting can lead to the growth of algae. Usually a floating plant, but one that can and does take root, a gravel-like substrate is recommended, as they tend to have difficulty rooting in a more dense, sandy substrate. The substrate should have a high organic content to prvide nourishment and promote health and good growth. A study on how the spread of aquatic weeds in freshwater sources in South Africa affects the Midmar dam claims that Anacharis can have a significant effect on its ecosystem. It warns that it can spread at a rate of 50 percent per year under optimum conditions. This proved hazardous in the case of the study, and the spread was attributed to the disposal of aquarium waste near the dam. In the tank environment, regular trimming is often necessary, particularly in the case of nutrient-rich water. Anacharis can grow over one inch every day, which is why we emphasize the importance of upkeep. Intense light, fertilizer, and carbon dioxide supplements are all high-growth factors. 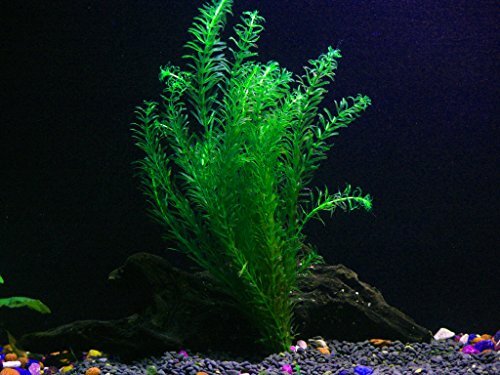 But the most important aspect of maintaining your Anacharis is trimming it to ensure it doesn’t overtake your aquarium – some of the long stems might often need to be cut. Begin cutting the plant once it reaches a length of eight inches. At that point, trim it three or four inches from the top, before the original stem branches off from the cut point. Also trim the leaves from the lower part of the new cutting, before pushing the stem into the substrate. The new cutting will then send out roots as it begins growing as a new, standalone plant. You could cut off the branches as well as they reach the same length of three to four inches. Priced at as low as $3 for a bunch of six to 15 stems, this is one of the cheapest species you could add to your aquarium. Some variations could have a higher pricing point, but in all cases, it’s a low-cost investment as an oxygenator and food source in ponds and aquariums alike. During your purchase, watch out for brownish or yellowish hues, which are usually a sign that the plant is dying or dead. When appropriately cared for, as previously mentioned, it can have various benefits, including promoting clarity in the aquarium, regulating the waters, and upping your tank’s overall health. Here’s how to prepare your aquarium for this plant which particularly needs minerals to grow and thrive. First, rinse off the plants and remove them from any containers, taking off the rubber bands, and cutting any dead roots or leaves. Watch out for any snails as you inspect the folaige, as it might be best to remove them if you’re looking to have a strictly plant aquarium. As a rule of thumb, stem plants are best if not planted since roots grow at their nodes, and as they are more sensitive, clipping the plants or tying them to a piece of wood or rock is the appropriate alternative. Here’s a video guide on preparing Anacharis before adding it to your aquarium. This plant often reproduces with flowers, although this doesn’t commonly happen in aquariums. The uppermost part of the stem sends out a short stock when that happens that can get about an inch above the water. Anacharis is particularly easy to cultivate in captivity, but also be careful to always dry out or burn any cuttings, as opposed to allowing it into waterways, which it can grow in, take over and clog. This powerful plant takes up fish waste, phosphate, and ammonia, which makes it highly compatible with various species. From some types of turtles to snails, you’ll find that numerous aquatic species may use it as a food source. Cichlids and goldfish also take a liking to it. Adequate care is certain to pay off and reap many benefits for your tank. This live plant will also thrive in the outdoor environment of a pond or water garden, where fish species may be more diverse. Since it’s a fast grower, a mere few stems grow and reproduce in a process whereby they are almost renewed. To propagate the plant, simply cut a healthy stem from the main plant. Your selected part should be at least eight inches in length. It’s also important to trim the leaves and plant them into the substrate on a regular basis, which will prevent them from rotting. As an invasive species, it is illegal in several states. It is one of the rare aquatic plants that remain green throughout the year. Each plant produces either male or female flowers. The Anacharis has been dubbed the beginner of beginners’ plants for good reason – there’s really not much you need to do to grow, care for and enjoy them. At the same time, they can be highly benefitial your aquariums overall health. Even if the time you can spend on upkeep is limited, it’s safe to say that this minimal time is all that’s needed. If there’s anything more you’d like to know about in the Anacharis care process, leave us a comment and we’ll get back to you right away!